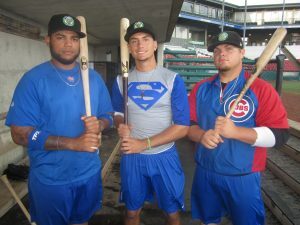 Albert Almora, Jr., predicting his future with a Superman shirt, was flanked by Rock Shoulders (left) and Dan Vogelbach (right) at Kane County in 2013. Wallis, pride of Southern Illinois University-Edwardsville, had his 15 minutes of fame in 1976. Regarded as a great outfield prospect, he actually pushed defensively-competent Rick Monday to first base for the last two months of the 87-loss ’76 season. He’d make some artificially-brilliant catches running straight back from his shallow positioning. WGN thought it would have some fun, so with its game-coverage TK-44 camera taped Wallis running backwards till he ran out of room at the vines. A WGN film crew, then set up atop the bleachers, then caught Wallis, still in his No. 28 uniform, continuing his jaunt across Waveland Avenue ’til he caught the ball. The two segments were spliced together with Tarzan’s yodeling as its audio backdrop. Problem was, Wallis couldn’t hit enough to stay a regular, and eventually was palmed off in 1978 on the Oakland Athletics in one of many trades A’s owner Charlie Finley concocted with the Cubs. 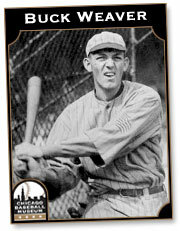 The Cubs shockingly traded Andy Pafko to the Dodgers on June 15, 1951 and never really filled his position. Successions of managements believed anyone could play center. Corner outfielders like Hickman, Billy Williams (three weeks to start the 1965 season), Alfonso Soriano, Bobby Thomson, George Altman, Kosuke Fukudome, Jerry Morales, Byron Browne, Scot Thompson, et. al. First basemen like Joe Pepitone and Leon Durham. Even a second baseman like Glenn Beckert, one forgettable start in Atlanta in 1970. When they finally got ahold of Jim Edmonds to play center in 2008, the longtime Cubs nemesis was near the end of the line. I joked with Terry Francona, a brief Cubs extra man as a sore-kneed pinch hitter and first baseman in 1986, that he’d draw center-field duty. Francona laughed. One day he found himself playing center between Gary Matthews, Sr. in left and Keith Moreland in right. Run, Tito, run! But after all this time, Almora, Jr., plugs all gaps, on the field and in the depth chart. Good things should happen to good people. He just needs to go on a hitting tear, and cannot be denied from that point forward.